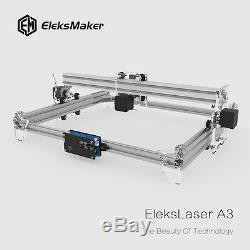 EleksLaser A3 2500mW Desktop DIY Violet Laser Engraver Cutter. Advanced Edition(GRBL)/ Simple version(Benbox). 30x40cm / 11.81 x 15.75inch (maximum). 58x40x14cm / 22.83x15.75x5.51inch (LWH). 60x46x18cm / 23.62x18.11x7.09inch (LWH). 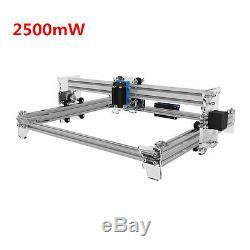 Ideal for amateur laser engraving usage low-light positioning and freedom positioning functions. Ultra large engraving area, gantry shape design, no engraving height limitation. 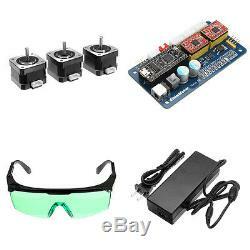 Three stepper motor drive providing. 2500mW violet laser module with heatsink, high laser engraving power and long-term available. Can print any pictures easily. DIY Projects Show with EleksLaser. The New Instruction and Software can be downloaded from the Eleksmaker website. Please wear laser goggles during usage and avoid touching the laser directly with your eyes and skin! 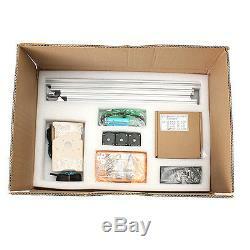 This is a whole assemble set and needs to assemble by your own. Please note that the laser module should work less than half an hour in one time, and then continue to work after cooling down. If you have any quality problem(Except individual situation like using the laser module more than 30 minute one time and casue the damage), please feel free to ask our customer service for a help. Q:Does this machine need to be assembled when I received it? 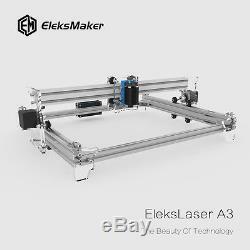 A:There is a set of A3 laser machine parts that needs you to assemble by yourselves, but we have introduction video to show you how to assemble it, it is very intersting, and rich information, practical skill then you will get from the DIY. Q:Whick type computer system can run its software? A:The software only support the Windows system. Q:If I received the product but it is broken during the tranportation, What can I do? A:Please contact with us, we will send you the replacement parts for free. Q:What's the machine's lifetime? A:The machine is made from the aluminum alloy and acrylic. Its lifetime depend on the laser module lifetime. The laser module have over 6,000 hours lifetime. Q:If the laser module is broken during usage, Where can I get the replacement one? Q:What's the size of this machine's engraving area? A:The machine's largest engraving area is 30X40cm. Q:What material can it engrave? A:Wood, bamboo, plastic, paper, leather, rubber. Q:What material can it cut? A:Foam, paper, thin leather. Q:Can I use it to cut or engrave on metal? A:It can not engrave or cut on any metal. Q:Can I regulate the laser power or the laser power is adjustable? A:Sorry that the laser power is not adjustable, but the engraving speed is adjustable. Q:How long can the machine work continuously? A:It can work continuously about 12 hours, after the laser mould cool down(about half of an hour), then start work again. Long time work continuously with shorten the laser module liftetime. Q:Can I upgrade the stronger power laser module by myself? 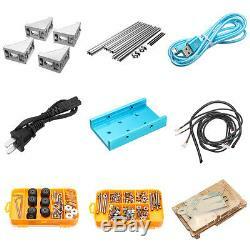 A:Of course you can, this machine provide the DC 12V power supply for laser module. So any 12V power supply laser module can be installled on this machine. But you need to connect the laser cable with the right polarity, the red is positive, otherwise the laser mdoule will burn down. Q:Can I extend the slide rail to expand its engraving area? But you need to find the the slide rail by yourself, we do not provide such extended slide rail. Q:When I receive it, how to let it work? A:Fist of all, you need to plug the stepper moter power cable to the controller board, then installl the software and the driver, power supply the machine, that's all. Q:What format of the pictures can Benbox support? A: It can support jpg /png /bmp /dxf etc. Q: If the engraving result is bigger than we set in GRBL, what should we do? We stand behind our products. We do our best to process as quickly as possible. 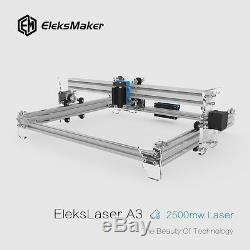 The item "EleksMaker Engraving Laser Cutting Machine A3 Pro 2500mW USB Wood Engraver" is in sale since Wednesday, December 27, 2017. This item is in the category "Business & Industrial\Printing & Graphic Arts\Screen & Specialty Printing\Engraving". 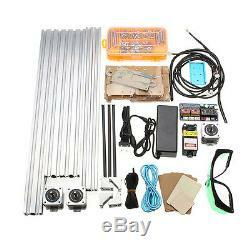 The seller is "web_star" and is located in Guangzhou. This item can be shipped worldwide.